With over 31 years serving the tree care industry John has been caring for the needs of his clients from the first moment he climbed a tree. Realizing that to grow and become the best in the profession John went to school and obtained his ISA Arborist Certification in 1997. Since that time John has continued his education by attending 30 hours or more each year to maintain his license. John is also a TRAQ Tree Risk Assessor. This is a select certification that is very sought after by cities, states and local municipalities. This is important for clients who would like to know the real risk that their trees may present. John is one of the most respected and sought after ISA Arborists in the Seattle and Puget Sound area. Click to learn more about the high standards and code of ethics to which an ISA Certified Arborist must adhere. KTI’s staff includes some of the best and most qualified personnel in the area. Our crew prides themselves on hard work, safety and our climbers are well established, and doing the job as if they were working at their own home. We have an experienced ISA and TRAC Certified Arborist on staff as well as a Certified Horticulturist to provide the services our clients need. KTI is licensed, bonded and fully insured from the moment we arrive at your location. Our staff works diligently to ensure our customer’s needs are met beyond their expectations. KTI stands behind all of our work. If a customer is dissatisfied at all, in any way, we are here to provide assistance to resolve the matter to your desired specifications. Though we have an extremely low percentage of accidents (less then 1%) we have the personnel available to repair any possible problem. Kenny Tree Inc. has all of the resources, expertise and ability to complete any tree service job to the highest standard of professionalism and quality you will see in the industry today. Fill out the free estimate form for any tree service. 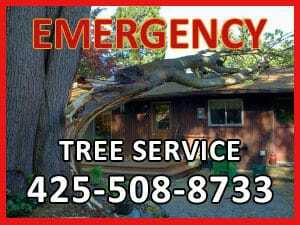 Kenny Tree Incorporated provides 24-Hour Emergency Tree Service and tree care to the greater Puget Sound and Western Washington areas! Call 425-508-8733 or go to the contact us page to fill out our estimate request form for a FREE ESTIMATE on any service we provide. © 2011-2018 Kenny Tree Inc. All Rights Reserved. Website designed and developed by Kenny Tree Incorporated.